(2) the destruction of the Beast and his host, “the kings of the earth and their armies,” and the false prophet, which is the “great and terrible’ aspect of the day Revelation 19:11-21. (3) the judgment of the nations Zechariah 14:1-9; Matthew 25:31-46. (4) the thousand years, i.e, the kingdom-age Revelation 20:4-6. (5) the Satanic revolt and its end Revelation 20:7-10. (7) the “day of God,” earth purged by fire 2 Peter 3:10-13. (5) the rapture of the true church 1 Thessalonians 4:17. (7) the apocalyptic judgments (Rev. 11.-18.). 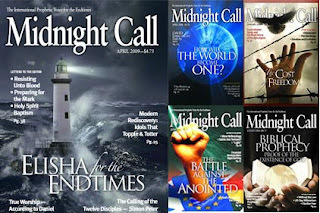 Dutch evangelist Dr. Wim Malgo [1922-1992] founded Midnight Call in 1955 with a four-fold purpose in mind: (1) To call people to Christ; (2) To proclaim the Second Coming of Christ; (3) To prepare the Church for His coming; and (4) To uphold the faith and warn of false doctrines. 17 For, behold, I create new heavens and a new earth: and the former shall not be remembered, nor come into mind. 18 But be ye glad and rejoice for ever in that which I create: for, behold, I create Jerusalem a rejoicing, and her people a joy. 19 And I will rejoice in Jerusalem, and joy in my people: and the voice of weeping shall be no more heard in her, nor the voice of crying. 11 And I saw heaven opened, and behold a white horse; and he that sat upon him was called Faithful and True, and in righteousness he doth judge and make war. 12 † His eyes were as a flame of fire, and on his head were many crowns; and he had a name written, that no man knew, but he himself. 13 And he was clothed with a vesture dipped in blood: and his name is called The Word of God. 14 And the armies which were in heaven followed him upon white horses, clothed in fine linen, white and clean. 15 And out of his mouth goeth a sharp sword, that with it he should smite the nations: and he shall rule them with a rod of iron: and he treadeth the winepress of the fierceness and wrath of Almighty God. 16 And he hath on his vesture and on his thigh a name written, KING OF KINGS, AND LORD OF LORDS. 17 And I saw an angel standing in the sun; and he cried with a loud voice, saying to all the fowls that fly in the midst of heaven, Come and gather yourselves together unto the supper of the great God; 18 That ye may eat the flesh of kings, and the flesh of captains, and the flesh of mighty men, and the flesh of horses, and of them that sit on them, and the flesh of all men, both free and bond, both small and great. 19 And I saw the beast, and the kings of the earth, and their armies, gathered together to make war against him that sat on the horse, and against his army. 20 And the beast was taken, and with him the false prophet that wrought miracles before him, with which he deceived them that had received the mark of the beast, and them that worshipped his image. These both were cast alive into a lake of fire burning with brimstone. 21 And the remnant were slain with the sword of him that sat upon the horse, which sword proceeded out of his mouth: and all the fowls were filled with their flesh. 1 Behold, the day of the LORD cometh, and thy spoil shall be divided in the midst of thee. 2 For I will gather all nations against Jerusalem to battle; and the city shall be taken, and the houses rifled, and the women ravished; and half of the city shall go forth into captivity, and the residue of the people shall not be cut off from the city. 3 Then shall the LORD go forth, and fight against those nations, as when he fought in the day of battle. 4 And his feet shall stand in that day upon the mount of Olives, which is before Jerusalem on the east, and the mount of Olives shall cleave in the midst thereof toward the east and toward the west, and there shall be a very great valley; and half of the mountain shall remove toward the north, and half of it toward the south. 5 And ye shall flee to the valley of the mountains; for the valley of the mountains shall reach unto Azal: yea, ye shall flee, like as ye fled from before the earthquake in the days of Uzziah king of Judah: and the LORD my God shall come, and all the saints with thee. 6 And it shall come to pass in that day, that the light shall not be clear, nor dark: 7 But it shall be one day which shall be known to the LORD, not day, nor night: but it shall come to pass, that at evening time it shall be light. 8 And it shall be in that day, that living waters shall go out from Jerusalem; half of them toward the former sea, and half of them toward the hinder sea: in summer and in winter shall it be. 9 And the LORD shall be king over all the earth: in that day shall there be one LORD, and his name one. 31 When the Son of man shall come in his glory, and all the holy angels with him, then shall he sit upon the throne of his glory: 32 And before him shall be gathered all nations: and he shall separate them one from another, as a shepherd divideth his sheep from the goats: 33 And he shall set the sheep on his right hand, but the goats on the left. 34 Then shall the King say unto them on his right hand, Come, ye blessed of my Father, inherit the kingdom prepared for you from the foundation of the world: 35 For I was an hungred, and ye gave me meat: I was thirsty, and ye gave me drink: I was a stranger, and ye took me in: 36 Naked, and ye clothed me: I was sick, and ye visited me: I was in prison, and ye came unto me. 37 Then shall the righteous answer him, saying, Lord, when saw we thee an hungred, and fed thee? or thirsty, and gave thee drink? 38 † When saw we thee a stranger, and took thee in? or naked, and clothed thee? 39 † Or when saw we thee sick, or in prison, and came unto thee? 40 And the King shall answer and say unto them, Verily I say unto you, Inasmuch as ye have done it unto one of the least of these my brethren, ye have done it unto me. 41 Then shall he say also unto them on the left hand, Depart from me, ye cursed, into everlasting fire, prepared for the devil and his angels: 42 For I was an hungred, and ye gave me no meat: I was thirsty, and ye gave me no drink: 43 I was a stranger, and ye took me not in: naked, and ye clothed me not: sick, and in prison, and ye visited me not. 44 Then shall they also answer him, saying, Lord, when saw we thee an hungred, or athirst, or a stranger, or naked, or sick, or in prison, and did not minister unto thee? 45 Then shall he answer them, saying, Verily I say unto you, Inasmuch as ye did it not to one of the least of these, ye did it not to me. 46 And these shall go away into everlasting punishment: but the righteous into life eternal. 4 And I saw thrones, and they sat upon them, and judgment was given unto them: and I saw the souls of them that were beheaded for the witness of Jesus, and for the word of God, and which had not worshipped the beast, neither his image, neither had received his mark upon their foreheads, or in their hands; and they lived and reigned with Christ a thousand years. 5 But the rest of the dead lived not again until the thousand years were finished. This is the first resurrection. 6 Blessed and holy is he that hath part in the first resurrection: on such the second death hath no power, but they shall be priests of God and of Christ, and shall reign with him a thousand years. 7 And when the thousand years are expired, Satan shall be loosed out of his prison, 8 And shall go out to deceive the nations which are in the four quarters of the earth, Gog and Magog, to gather them together to battle: the number of whom is as the sand of the sea. 9 And they went up on the breadth of the earth, and compassed the camp of the saints about, and the beloved city: and fire came down from God out of heaven, and devoured them. 10 And the devil that deceived them was cast into the lake of fire and brimstone, where the beast and the false prophet are, and shall be tormented day and night for ever and ever. 3 And I will give power unto my two witnesses, and they shall prophesy a thousand two hundred and threescore days, clothed in sackcloth. 4 These are the two olive trees, and the two candlesticks standing before the God of the earth. 5 And if any man will hurt them, fire proceedeth out of their mouth, and devoureth their enemies: and if any man will hurt them, he must in this manner be killed. 6 These have power to shut heaven, that it rain not in the days of their prophecy: and have power over waters to turn them to blood, and to smite the earth with all plagues, as often as they will. 12 And I beheld when he had opened the sixth seal, and, lo, there was a great earthquake; and the sun became black as sackcloth of hair, and the moon became as blood; 13 And the stars of heaven fell unto the earth, even as a fig tree casteth her untimely figs, when she is shaken of a mighty wind. 14 And the heaven departed as a scroll when it is rolled together; and every mountain and island were moved out of their places. 15 And the kings of the earth, and the great men, and the rich men, and the chief captains, and the mighty men, and every bondman, and every free man, hid themselves in the dens and in the rocks of the mountains; 16 And said to the mountains and rocks, Fall on us, and hide us from the face of him that sitteth on the throne, and from the wrath of the Lamb: 17 For the great day of his wrath is come; and who shall be able to stand? 1 But of the times and the seasons, brethren, ye have no need that I write unto you. 2 For yourselves know perfectly that the day of the Lord so cometh as a thief in the night. 3 For when they shall say, Peace and safety; then sudden destruction cometh upon them, as travail upon a woman with child; and they shall not escape.